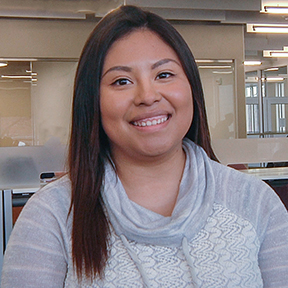 Gabriela Jaimes, 23, of Cedar Lake, graduates this May with a double bachelor’s degree in chemistry and Spanish, and a minor in biology. The oldest of five siblings, Jaimes is a first-generation middle school graduate, a first-generation high school graduate, and this May, she will proudly become her family’s first college graduate. With a dream of providing a better life for their family in the U.S., Jaimes’ parents emigrated from Mexico when they were young. They had little knowledge about how higher education works, so Jaimes knew she had to get involved, ask questions, find personal mentors and use campus resources at Indiana University Northwest if she was going to succeed. It’s easy to understand why she lives by the slogan, “Sí, se puede,” or “Yes, it’s possible,” coined by civil rights activist Cesar Chavez and popularized by Barack Obama during his 2008 presidential campaign. Jaimes has proven that with hard work, anything is possible. And she’s not done yet. By the end of the year, Jaimes will leave for Guadalajara, Mexico where she will begin medical school in January of 2019. She hopes to one day establish a medical clinic and provide health care services for underserved women and children. Throughout her college experience, Jaimes said she has discovered so much about herself thanks to the opportunities she’s had to travel both nationally and internationally. IU Northwest has given her the opportunity to study and attend events and conferences in major cities, including Chicago, Washington, D.C., and Indianapolis. She also spent a semester studying abroad in Bilbao, Spain. Some of the other experiences that have shaped her education include working as a teaching assistant for anatomy and physiology and as a private tutor for Student Support Services, and conducting research about the evolution of language in Northwest Indiana over the past 50 years. An energetic leader, Jaimes is president of the Student Government Association, a Student Ambassador and former board member of the Student Activities Board.